This 18 plasmid CRISPR kit is used to construct all-in-one CRISPR/Cas9 vectors expressing multiple gRNAs with either Cas9 nuclease or Cas9 D10A nickase. A separate accessory pack is available for dCas9 and FokI-dCas9. Multiplex genome engineering in human cells using all-in-one CRISPR/Cas9 vector system. Sakuma T, Nishikawa A, Kume S, Chayama K, Yamamoto T. Sci Rep. 2014 Jun 23;4:5400. doi: 10.1038/srep05400. PubMed . The Multiplex CRISPR/Cas9 Assembly System Kit enables construction of all-in-one CRISPR/Cas9 vectors expressing multiple gRNAs (2-7) and a Cas9 nuclease or nickase . 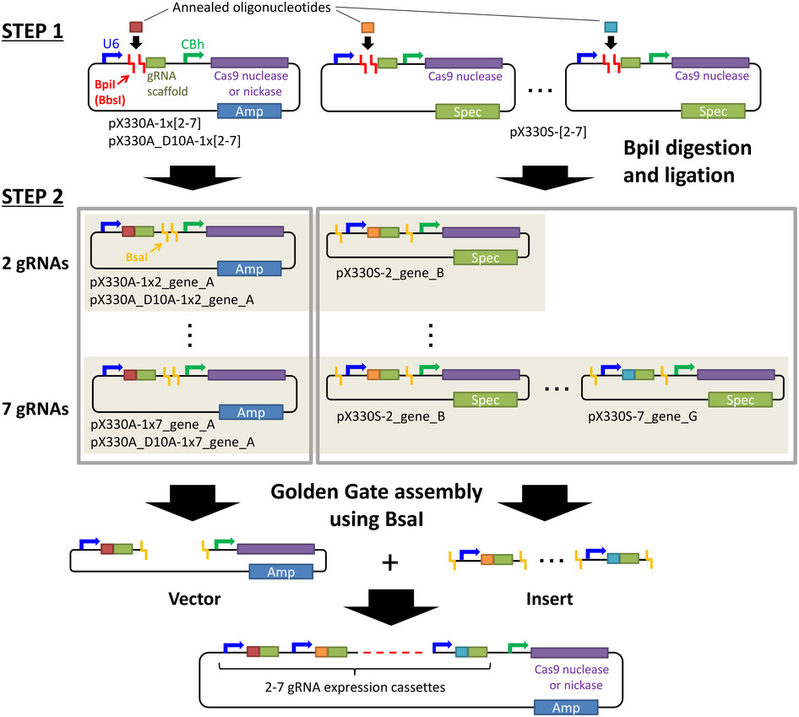 Multiple gRNA cassettes are assembled using BsaI-mediated Golden Gate cloning method. The kit contains 18 plasmids: pX330A-1x[2-7], pX330A_D10A-1x[2-7], and pX330S-[2-7]. Figure from Sakuma et al., Sci Rep . 2014 Jun 23;4:5400. Download a PDF Protocol for Multiplex CRISPR construction as described in the above article. "The CRISPR kit used for constructing multiplex CRISPR/Cas9 vectors was a gift from Takashi Yamamoto (Addgene kit # 1000000054)"